Can you originate a Coo Coo Contraption? 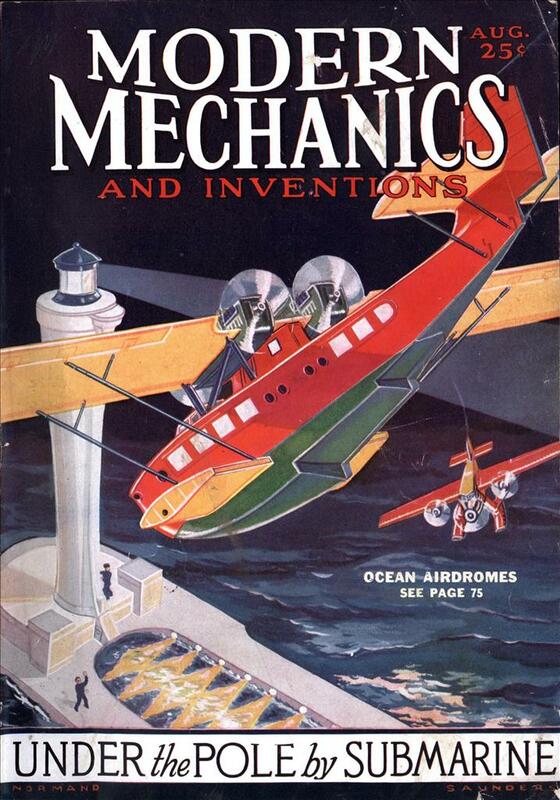 If you are a Coo Coo Inventor, your ideas may earn you a prize check from Modern Mechanics! These Coo Coo’s below cashed in! 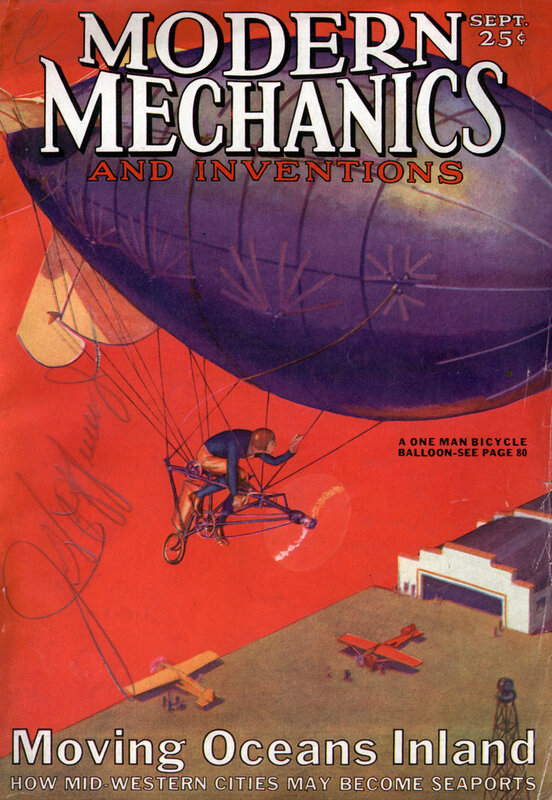 Entries in Modern Mechanics’ Coo Coo Contraptions contests continue to grow better and more numerous each month. If corporations have not already been formed to manufacture some of the devices that have been concocted by coo coo inventors, the Coo Coo Editor is seriously thinking of resigning to promote such a scheme among wealthy capitalists. Huge profits could be reaped, he believes, from the sale of some of the apparatus that has originated in the minds of some of the contestants. 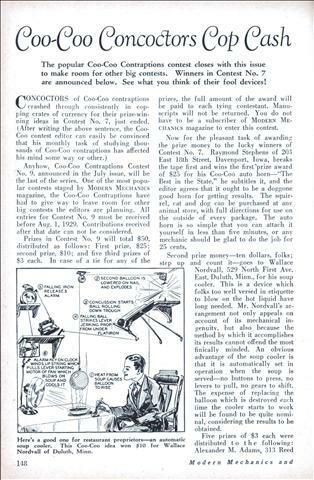 Names of the Winners of Coo-Coo Contraptions Contest No. 1 and Details of Contest No. 4 are Printed Below. 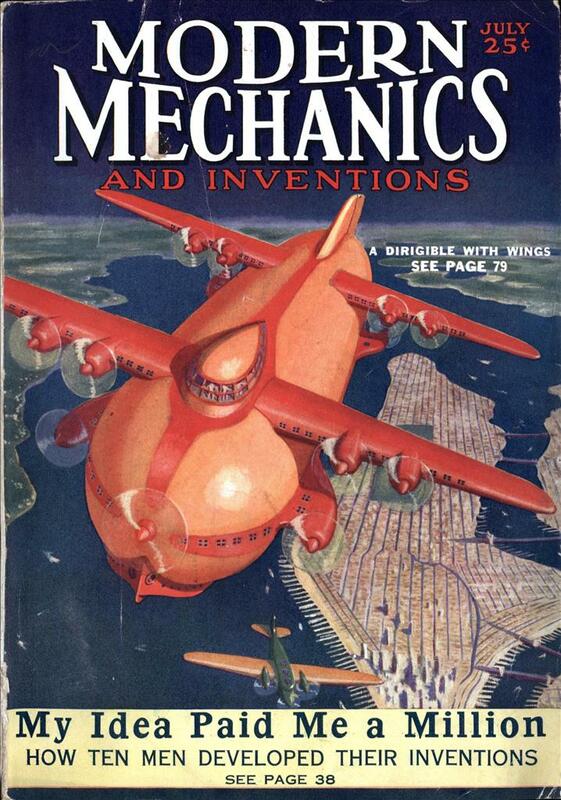 LISTEN in now, all you folks who sent in entries in Coo-Coo Contraptions Contest No. 1! The winners have been picked and we’re all set to announce the names of the seven lucky contestants. Before doing so, however, the harassed judges wish to thank all the entrants in the contest for the ingenious contrivances which they submitted. It was a Herculean task to select the seven winners from the avalanche of submissions which descended on the editorial office. 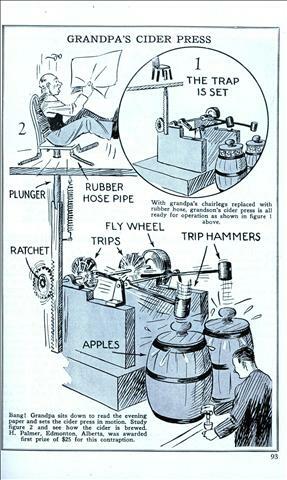 First prize of $25 went to H. Palmer, 11548 95th Street, Edmonton, Alberta, one of our Canadian readers, for his ingenious cider press shown on the opposite page. 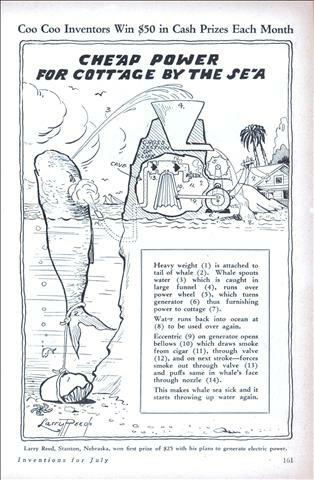 We think you will agree with us that the press classifies as a Coo-Coo Contraption of the first water. Second prize of SIO was awarded Alexander M. Adams, 313 Reed St., Clearfield, Pa., for his nutcracker shown on this page. 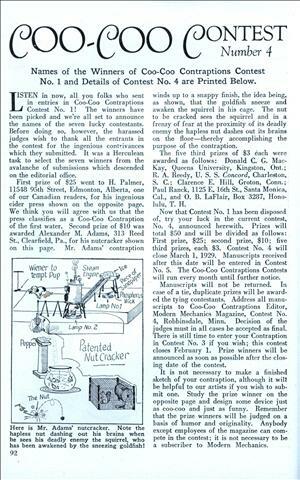 Mr. Adams’ contraption winds up to a snappy finish, the idea being, as shown, that the goldfish sneeze and awaken the squirrel in his cage. The nut to be cracked sees the squirrel and in a frenzy of fear at the proximity of its deadly enemy the hapless nut dashes out its brains on the floor—thereby accomplishing the purpose of the contraption. The five third prizes of $3 each were awarded as follows: Donald C. G. Mac-Kay, Queens University, Kingston, Ont; R. A. Reedy, U. S. S. Concord, Charleston, S. C; Clarence E. Hill, Groton, Conn.; Paul Ranck, 1125 E. 16th St., Santa Monica, Cal., and 0. B. LaFlair, Box 3287, Honolulu, T. H.
Now that Contest No. 1 has been disposed of, try your luck in the current contest, No. 4, announced herewith. Prizes will total $50 and will be divided as follows: First prize, $25; second prize, $10; five third prizes, each $3. Contest No. 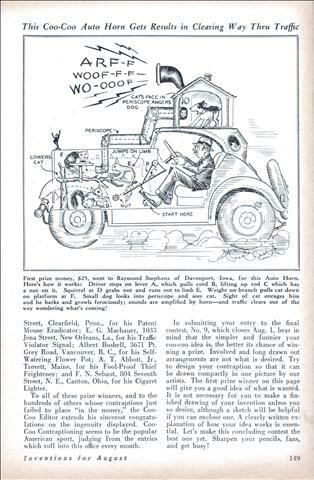 4 will close March 1, 1929. Manuscripts received after this date will be entered in Contest No. 5. The Coo-Coo Contraptions Contests will run every month until further notice. Manuscripts will not be returned. In case of a tie, duplicate prizes will be awarded the tying contestants. 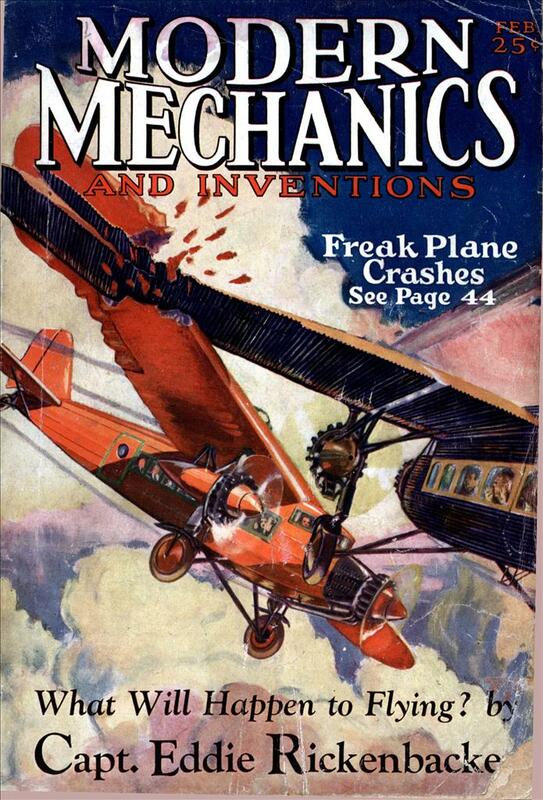 Address all manuscripts to Coo-Coo Contraptions Editor, Modern Mechanics Magazine, Contest No. 4, Robbinsdale, Minn. Decision of the judges must in all cases be accepted as final. 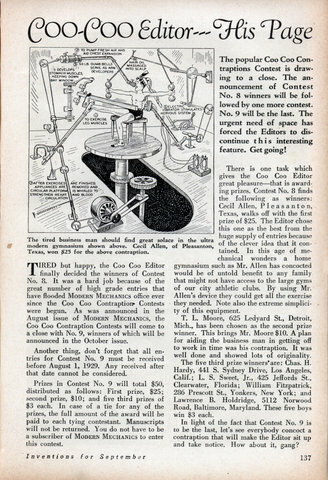 There is still time to enter your Contraption in Contest No. 3 if you wish; this contest closes February 1. Prize winners will be announced as soon as possible after the closing date of the contest. It is not necessary to make a finished sketch of your contraption, although it will be helpful to our artists if you wish to submit one. Study the prize winner on the opposite page and design some device just as coo-coo and just as funny. Remember that the prize winners will be judged on a basis of humor and originality. 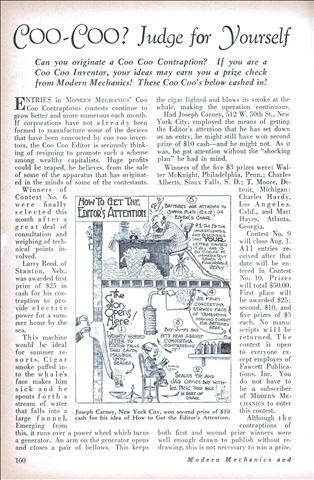 Anybody except employees of the magazine can compete in the contest; it is not necessary to be a subscriber to Modern Mechanics. The popular Coo Coo Contraptions Contest is drawing to a close. The announcement of Contest No. 8 winners will be followed by one more contest. No. 9 will be the last. The urgent need of space has forced the Editors to discontinue this interesting feature. Get going!